This paper examines productivity differences between internationally trading and non-trading firms using data on a sample of firms from 19 sub-Saharan African countries. 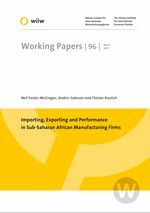 The paper provides the first evidence of whether exporters, importers and two-way traders perform better than non-traders, and whether there are differences in performance between different types of trading firms in sub-Saharan Africa. Our results indicate that exporters, importers and two-way traders perform better than non-exporters, non-importers and non two-way traders. We further find that two-way traders perform better than importers only or exporters only, results largely consistent with recent results for other countries and regions. Considering information on export starters, continuers and exiters we also present some evidence consistent with both self-selection and learning-by-exporting.